This RD250 caught my eye after recently winning the coveted Do The Ton Bike of the Month. The bike hadn’t run for 20 years when Ken Stout bought it as part of a package deal with two 60’s Honda Superhawks. Being a design engineer in the motorcycle/powersport industry it didn’t take him long to get it going. 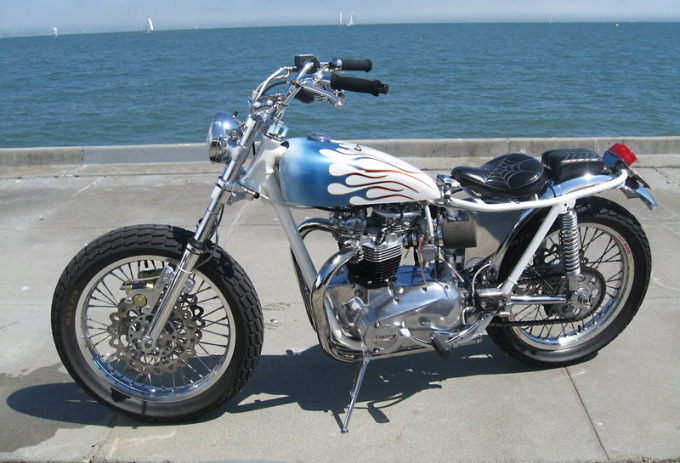 “After cleaning the carbs, new fuel line, and some gas, she fired right up” Ken said. 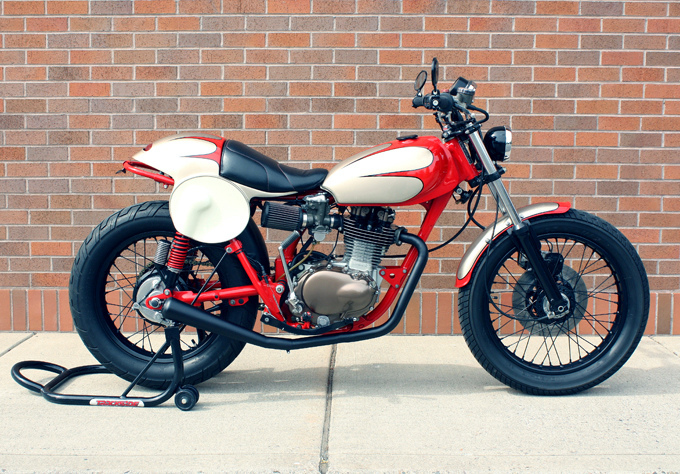 Ken wanted to do something special with the bike and decided to turn it into a street tracker. Larry Pearson is no newcomer to the pages of Pipeburn. 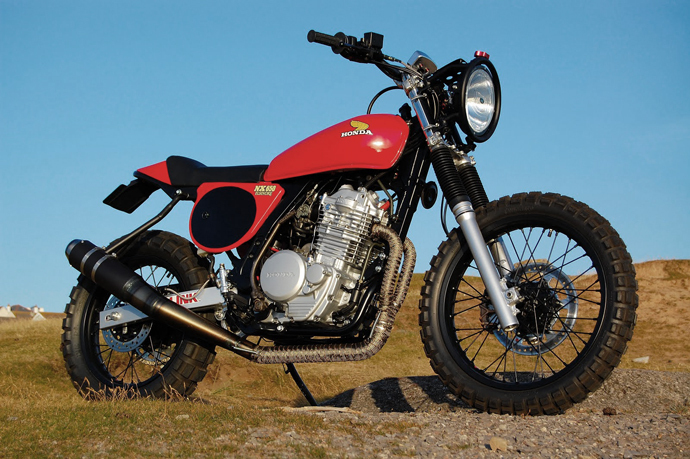 First we featured his beautiful CB550, then his Wes Cooley GS1000S (which is about to appear in Cycle World) and now this striking Honda XL250. 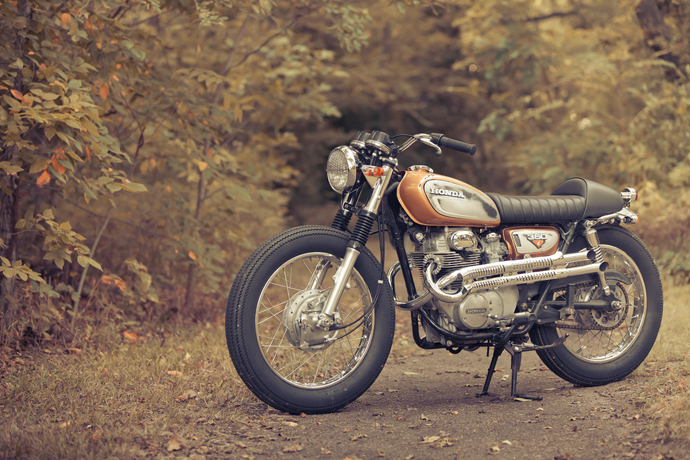 “A co-worker of mine had this dilapidated ’72 Honda XL250 that he used as a woods bike for 20 years” said Larry. 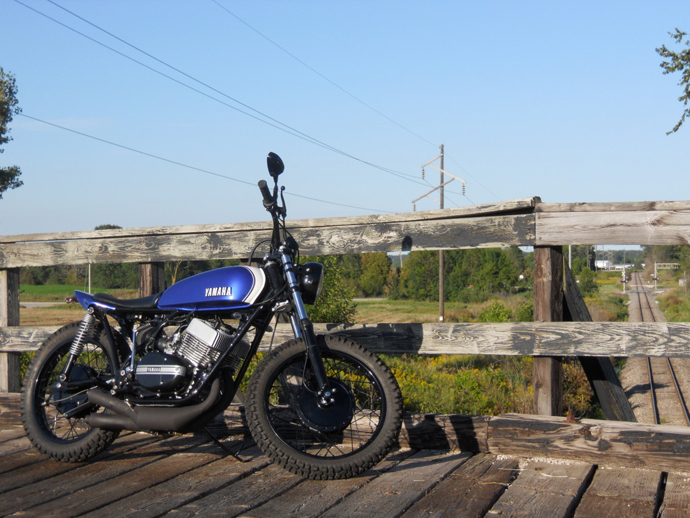 “He stripped it down, put a set of knobby tires on it and just rode it occasionally. It had been bored out to a 305cc and a mild cam installed by a previous owner.” For whatever reason it sat outside for about 5 years unused, until it was offered to Larry for free – just to see if he could do something with it. “I didn’t really have any need for a dirt bike, but when he told me about the engine and how well it ran, I went over for a look. Even after sitting outside for all those years, and with bad gas in the tank, it fired right up after about 5 kicks!.” Larry decided to haul it home. It was in terrible shape, with rust everywhere, dented tank, broken fenders, bent exhaust and anything else you can think of. Wondering what to do, Larry came up with the idea to make a retro motard. 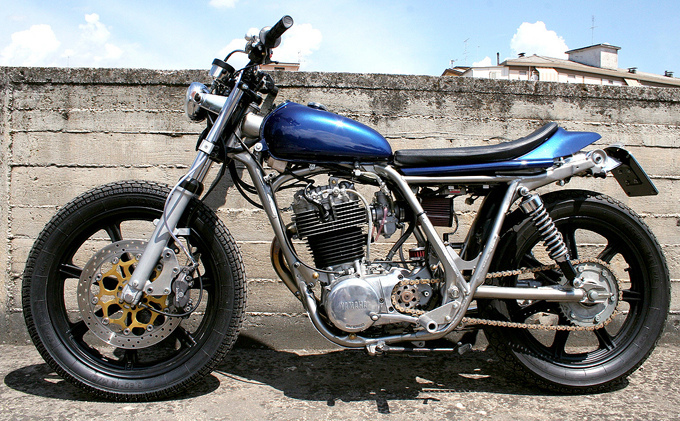 The idea to turn his SR500 into a street tracker came to Italian Andrea Costantini after viewing some photos of a Kim Boyle creation. “I searched the bike spasmodically, because I loved the mechanics” he says. Luckily for Andrea his father is a mechanical engineer and has a small workshop at home with a horizontal lathe, a vertical mill and a grinding wheel. 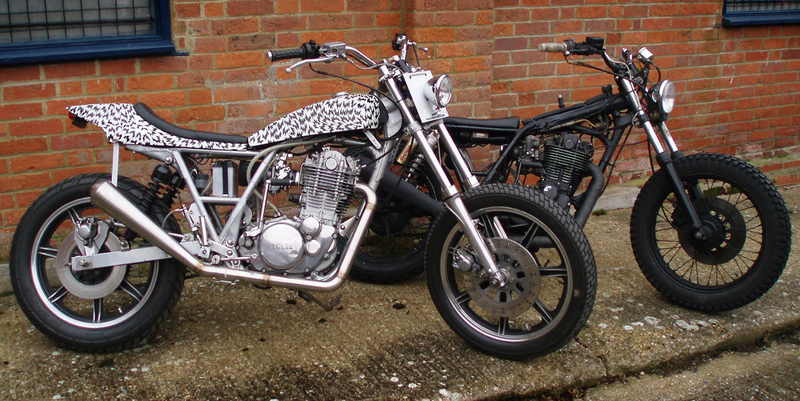 So with the help of his Dad, Andrea went about creating his dream street tracker. 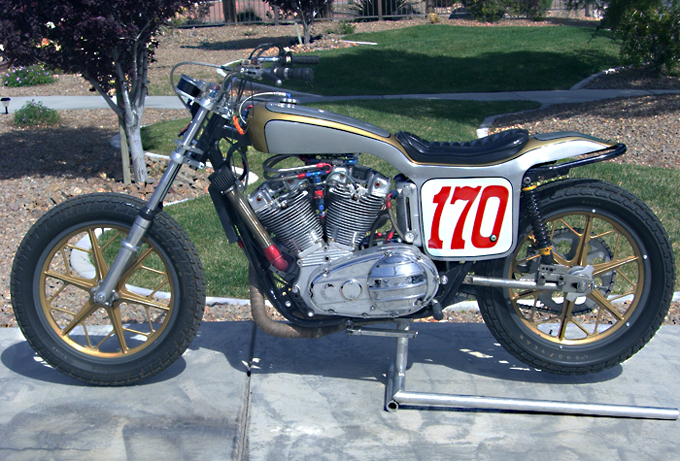 This is another unique Flat Tracker that is owned by Flat Track racer and enthusiast Bob Neilson. The Harley Sportster motor is housed in a legendary Trackmaster frame that has been highly modified, stretched 8 inches and all new mounts added. Trackmaster frames were built by Ray Hensley and were synonymous with track racing. Since Ray’s death these frames have been well sought after. Someone wiser than me once said “Ask and Thou Shall Receive“, I asked for your bikes and I did receive. We’ll start with this mouthwatering BSA Gold Star which was originally a long time racer ridden by Ramon ‘Porky’ Perez from Northern California. After he was injured several years ago he sold off most of his Gold Star racers including this one. 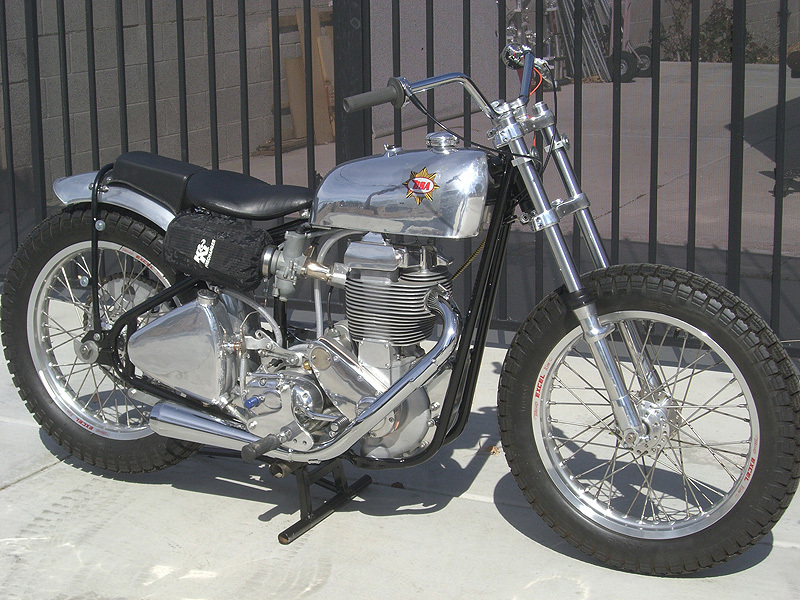 It was then purchased by flat track legend Tom Horton, who was a former pro National, sporting the number 55. The bike was stripped down and the motor was sent to Matt Hilgenburg from Speed & Sport in Northern California for a complete rebuild to race specs. 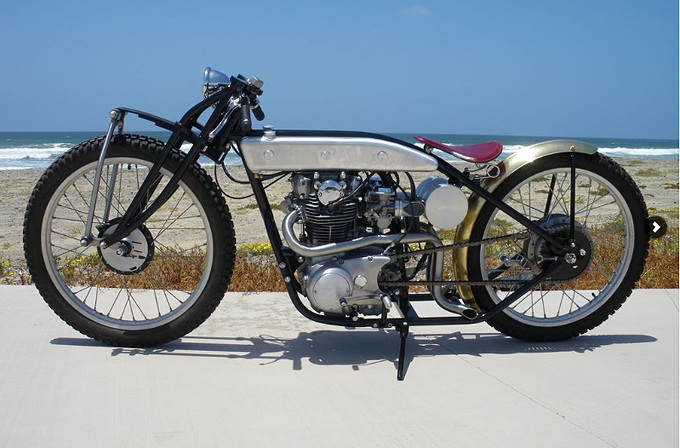 Stumbled across a blog called Triumph Flat Track, which as the name suggests is all about everything Triumph from vintage photos through to modern bike builds. Like this cool 1966 Triumph TT with the very retro looking leather spider seat and flame tank.